The ornament was designed using elements that transpired during President Roosevelt's administration. 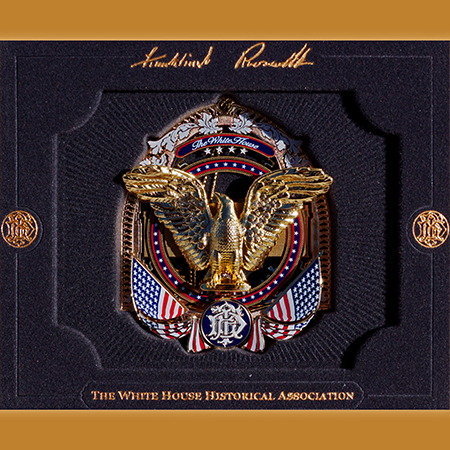 The eagle cartouche was displayed on President Roosevelt's first inauguration stand. Below the eagle is to flags with forty-eight stars representing the number of states in the union during Roosevelt's four terms. The shape of the ornament is reminiscent of the silhouette of a tabletop radio similar to ones American families listened to President Roosevelt's famous weekly Fireside Chats. Roosevelt's beloved dog Fala is pictured on the back of the ornament, sitting next to a festive Christmas tree and presents. A white leaf motif accenting the ornament edges is based on exterior stone molding that adorning the White House north portico entrance. Four stars toward the top of the ornament represent Roosevelt's historic four terms as president and the chevron border recalls the design of a card case he carried while serving in office.